A long time ago, I posted a very small resourcepack replacing chickens with Flappy Bird. Of course it got removed for being so small, so I came up with the idea for "Mini packs". They would be used to change small things, like maybe replacing the bow with a 3D crossbow, or maybe a music disc with Darude - Sandstorm (Heh), instead of downloading a full resourcepack and taking things you like from it and putting them into your own lil' resourcepack. A lot of people does not even know how to do that. More people would probably take things from other packs and upload them, saying that the pack is theirs, when it really isn't. You could create an "art blog" with your textures ... That's something that I'm fairly sure is allowed, and it won't clog up the texturepacks area with packs that aren't actually packs. Files can be uploaded to places like mediafire or dropbox and the link can be shared in the posts.. I used to be pretty sure that you could post these 'mini-packs' on the texture packs part of the forums? I am probably wrong. Furthermore, I agree with XDInsanity when he says it can easily be done. Texture packs take a lot of work and time and are not for people who do not have the time or ability to make them. They require a lot of creativity, originality and time. Having mini-packs sorta just turns texture pack making into little pixel art projects in my mind, although I would love if someone proved me wrong on that front. 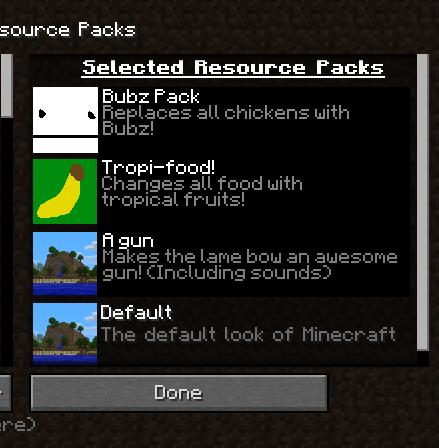 Of course people would post things that aren't in resourcepacks already.